Frederick is a San Francisco-based marketing automation platform for local services. The platform helps class and appointment-based businesses to increase revenue using fully automated, data-driven marketing. The platform analyzes small business management systems, intelligently combining historical customer and transaction data with utilization information to highlight potential empty times and days that businesses can promote to targeted customers. The platform sends automated emails and texts to specific customers who are most likely to be interested in your service, rewarding repeat clientele with special offers. 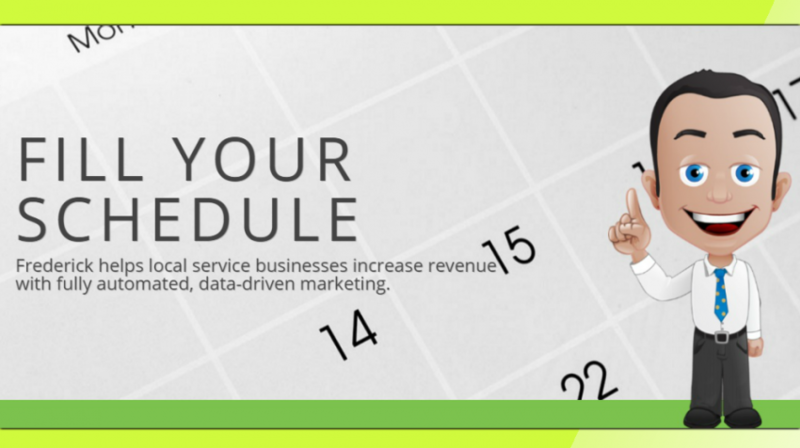 The service integrates with your existing management or calendar system to identify data, including real-time availability and customer history, as a way of driving the smartest marketing campaigns. The company uses a proprietary technology platform that translates appointment info into a personalized marketing plan. All appointments made though the service instantly sync with your calendar, giving you all this information in one place. The company says this will help you run your business more efficiently. You can also market your services to your customers on the go using Frederick’s text messaging service. The service lets you fill open slots and book more appointments using Frederick’s smart text messages. The service provides you with your own trackable phone number that you can put on your website or anywhere else where your business is listed. Your customers will automatically receive a thank you and an opt-in option to receive special offers. You can also use the service to send targeted texts to clients that don’t visit regularly. But with all these features, Fredericks says you still maintain complete control of the services that get promoted.